Many mothers have always looked to the hairbow as an accessory for dressing up their little princesses, but lately this remnant of the 50s women’s fashion became part of the established attire of adult women belonging to the rockabilly subculture. Another less likely category that makes use of hair bows are 18th century reenactors (as few of them as there are) since these were commonly worn by men of the period for keeping their hair tied together during battle. The hairbow came a long way since the 1700s and you might find them today in all shapes and sizes, made out of a dozen or so materials and employing a wide variety of systems for clipping them on to one’s hair. The range of options available makes finding the best hair bows for your needs all the harder, since not all of them offer the same advantages or disadvantages, especially when we consider that they should fit children of various ages. Personal style and preference will naturally fall down to each individual users, but before checking out hair bows reviews in search of the best item available for sale, there are a couple of things you must be aware of in order to ensure a good purchase. As we’ve mentioned, there are a number of mechanisms used for attaching the bow to the wearer’s head, and since these mostly come down to practicality rather than personal preference, they will definitely require a closer look. Snap clips are a popular choice for parents of toddlers since they are very comfortable to wear and adhere well to thinner hair. These are basically flat metal strips that due to their shape can “snap” into place when pushed, holding on to the hair. Usually covered in colorful plastic, small children are sure to love this type of clip and due to their rounded shape they won’t constitute a pocking hazard. However, snap clips can slide off fairly easy under intense play, so older children might require something that holds a little tighter. Alligator clips are good for this, especially as they come in many sizes, so there’s plenty to choose from for girls of different ages. Versions that also feature teeth will probably work best for kindergartners, who tend to be very active, while smooth varieties, also known as duck bills, will provide better comfort for older kids. All attaching solutions featured in this category will of course work for younger wearers, as well — and feel free to opt for any of them if it so strike your fancy — but these are generally found to be best suited for users that are a bit more mature. The elastic band works suitably well for all ages, but it won’t be as easy to fix on smaller children as other systems we’ve covered. Uncooperative toddlers might not stay put for the time required to tie the band while 5 year olds are known for their fascination with elastic material, and might find themselves picking at it. The headband with bow is an all time favorite for school age girls, who aren’t as energetic as kindergartners, while they are also better able to provide feedback to the parent in regards to how comfortable the band feels. This is important because the size of the headband must be chosen carefully to fit the child’s head — too tight and it might affect circulation, too wide and it will slide off. The French clips, also known as barrettes, make for a very stylish option for adult women and teens. These are locked into place by the use of two pieces of metal under tension and are very hard to accidentally unfasten. The hair sits between two bow-shaped strips of metal which can hold tightly to fairly thick strands, making it ideal for ponytails or half-ponytails. However, the barrette might slide off of thinner hair, although in some instances a third metal strip is used to better adapt it for use under such conditions. Like with the headband, some care must be given to ensure that the clip fits properly. 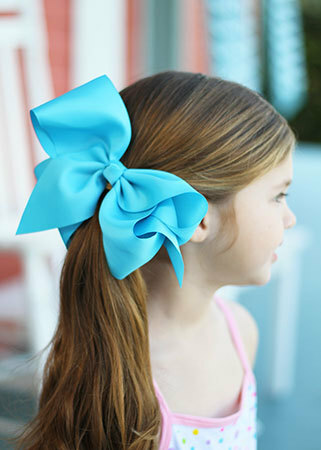 A common problem with hair bows is that of wrinkling and raveling over time, so the material must be chosen accordingly. Most manufacturers find that grosgrain ribbon offers the best solution for addressing these issues, while also fairly durable, flexible and overall stylish. This is mostly found in a glossy texture, but there is no limit to the colors available and grosgrain holds well to machine washing, so these won’t run in hot water. This makes it ideal for some nice-looking hair bows for children while more elegant but less convenient models might use satin or lace, the last one a favorite of Victorian fashion. Tulle, the same material used for ballerina dresses, is employed for highly delicate, but not very durable ribbons while velvet was favored throughout history for the particular shine it offers, albeit not being that suitable for machine washing. There are as many ways to tie a ribbon as there are to tie a naval knot, so feel free to scour the internet for written guides and instructional clips that will keep you up to date with what all the other DIYers are doing. Some popular hair ties became common for ready-made items which can be purchased from fashion stores and other retailers. These include spiked bows, tuxedo bows, pinwheel bows and flower bows, as well as the classic ribbon bows and bow tie bows, that might be favored by the traditionalist who doesn’t want to draw attention. For those that find themselves at the opposite end of the spectrum but can’t be bothered tying their own bows, there’s the option of acquiring a boutique bow, which are fairly expensive items (but not in anyway prohibitive) tied together by fashion designers and other types of specialists.